We’re world famous – in Auckland! 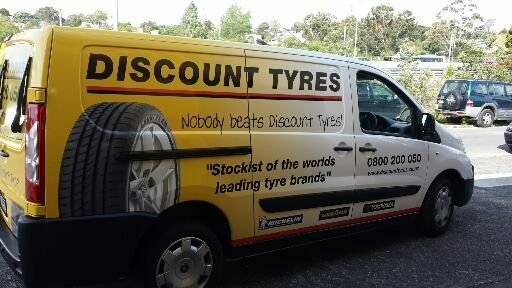 Discount Tyres is Auckland’s leading independent supplier of the best brand-name tyres around, with four branches in the region. We are known for discounting prices, not quality. Discount Tyres is what we do: budget tyres, cheap tyres, or just plain affordable tyres. Whatever you care to call them, they add up to the same thing — awesome value! We sell and fit tyres for small cars, family cars, 4-wheel drives and SUVs, as well as high performance vehicles. Family motorist, fast-car fanatic, petrolhead, or fresh new garage franchise, you simply won’t find a better deal on Dunlop, Goodyear, BFGoodrich, Yokohama, Michelin, Pirelli, Falken, Duro and Hankook — at Discount Tyres we’ll give you the best price, first time. You can find Discount Tyres branches and great tyre bargains at the following Auckland locations: Browns Bay, Takapuna, Glenfield and Grey Lynn. Dear Discount Tyres, Thank you for the outstanding customer service I received from Geoff at your Grey Lynn branch. I contacted Geoff three weeks ago for a quote. I rung around and my decision was based on the professionalism, knowledge and outstanding customer service I received from Geoff. I live on Waiheke Island. Our options are limited and prices are exorbitant. I contacted Geoff he gave me great advice, he also gave me options on different brands. My knowledge on tyres is ZERO. So for someone to help me + take the hassle out of thinking deserves recognition. The tyres were delivered free of charge to the wharf. Plus I feel Geoff went the extra mile to contact me to advise me the tyres are at the wharf. Can you please pass this feedback onto the manager of the Grey Lynn Branch. Hello, I'd just like to give my thanks for some great service we received from your crew at the Grey Lynn Branch today. I phoned earlier in the week for a quote for new front tyres for my wife's car. I was given a couple of options and booked it in for this morning. My wife said that your guys offered great service and were very efficient. She had planned on going for a walk with our young boy while the tyres were fitted but said she felt very comfortable waiting in your customer area while the work was done. Your staff also pointed out that the rear tyres were nearly 10 years old (possibly the original tyres on the vehicle) and that we should consider changing those too at some stage. I've had a closer look at the rear tyres and they are definitely showing signs of age and we now realise that they are probably not in the best condition for a family vehicle so we'll be back in the new year to get them changed. I know a lot of people would normally only take the time to complain about service, but my wife and I really appreciate when we do get great service so I just thought I'd pass on our thanks to your guys. Have a great Christmas! Hi, I would like this email to please get to head office, I recently popped into the Wairau branch with my children as I often do for all our tyre needs.On this occasion my 5 year old son needed the bathroom he had no shoes on and I was very reluctant to go into the bathroom as we have had bad experiences before with publicly used bathrooms. However needs must and I have to say we were both very pleasantly surprised, no cobwebs no urine on the floor and a VERY clean bowl I COMMEND you on your SANITISED bathroom. Thank you! We then went to the Archers Road branch to get our wheel alignment, where we went up stairs and sat in the kitchen waiting room, again very surprised at how clean the room was and I felt comfortable with my children. Thank you for your insight to provide clean premises for your customers. Discount Tyres was founded by Ray Coyle, a man who knows a bit about tyres. He’d been in the trade since 1977 and was a business development manager for Dunlop in 1993 when he decided it was time for a fresh start. He had spied a tyre business at a “great location”, Archers Road in Glenfield. The owner of John Cooper Automotive was none other than well-known tyre supremo Frank Allen. He sold Ray the business, and Ray set about building a reputation for supplying quality tyres at prices others couldn’t match, with a fast, efficient turnaround on fittings, wheel alignments and wheel balancing. In 2006, he bought another outlet on Wairau Road, Takapuna. It was called Discount Tyres. The name stayed, and so did the philosophy.